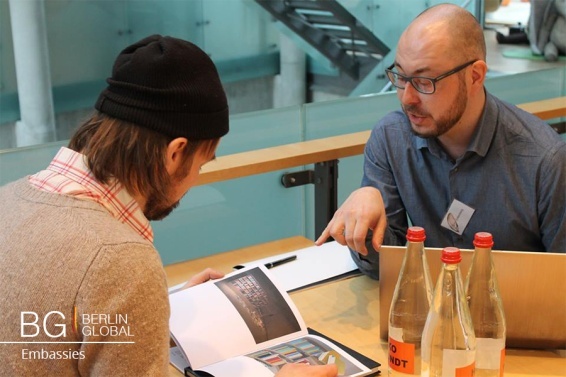 The event: “Grosses Treffen,” held on 16 April 2016 in Fellenhus, Nordic Embassies, in Berlin, attracted artists and curators to meet and discuss about their work and possible future partnership in a speed-dating manner. In the Press Release, people were able to hear more about the day: Mrs. Ovesen welcomed everyone to view the occasion and meet the sponsor of Grosses Treffen, Ola Kellgren, Director of Culture Point based in Helsinki, Finland; one of the jury members of Power Ekroth, and two artists from previous years: Dafna Maimo, Finnish-Israeli artists, who participated in 2013 and 2015, and Dan Stockholm, artist from Denmark who participated in 2013. The day was concluded by the speech of Swedish Ambassador of Germany, S. E. Lars Danielsson at 5 pm. The day was intense for both the artists and curators who view the portfolios. This year, 60 artists were selected to participate and 21 art experts viewed their work. Artists were assigned for 5 viewers and in 15 minutes they had to change as bell rang. The previous year participants Dan Stockholm and Dafna Maimon, described the day to be beneficial for both of them. Being a fresh graduate from art school, Stockholm reminisced the day as being a nice experience. The atmosphere was busy and the brief discussion with the juries who were different was good experience for young artist. The Grosses Treffen was a success for Stockholm as four out of five viewers contacted him. When asked about his experience as a Danish artist working in Berlin, Stockholm described Berlin to be a place where nationality does not matter. Artists can be themselves and present in their art who they are, without any defining restrictions form the country they came from. Berlin is full of individuals, a place of opportunities for artists. Dafna Maimon, on other hand, was more experienced artist and had already made name for herself in the art world, but the benefits of the occasion weren’t lost as she was apple to familiarize herself with the Nordic Art Scene and create even more connections. She also talked about the importance of the connections one is able to make by participating the event. Maimon is now working on a TV network with fellow artists to present exhibitions to broader audience. The perspective from Juror’s point of view, reveals how intense the day can be. During her year as a viewer, Power Ekroth met with 15 artists in 15 minutes’ sessions. 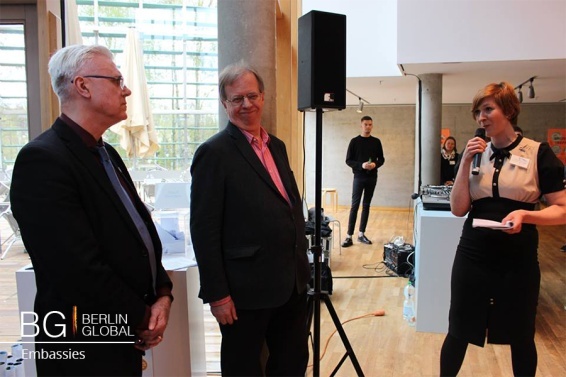 She acknowledges the opportunity that Grosses Treffen offered to the young artists who were inexperienced in integration to the art world. Ekroth described Berlin to be the number one place to be an artists, as there are lot of places to present one’s art and the living costs are low.